The Hofbrauhaus-Keller is an 850 years old property belonging to the Hofbrauhaus brewery in Freising located at the Lankesberg, a small hill close to the Freising city centre in a quite and residential area, approximately 43km north of central Munich. The Hofbrauhaus-Keller in Freising was originally a storage facility for cooling beer during the warm summer months. The building is of similar architecture to the original Hofbrauhaus brewery which is located nearby. In recent years the beer garden was managed by a leaseholder who discouraged the tradition of permitting guests to bring their own food, which caused many locals to boycott the beer garden. 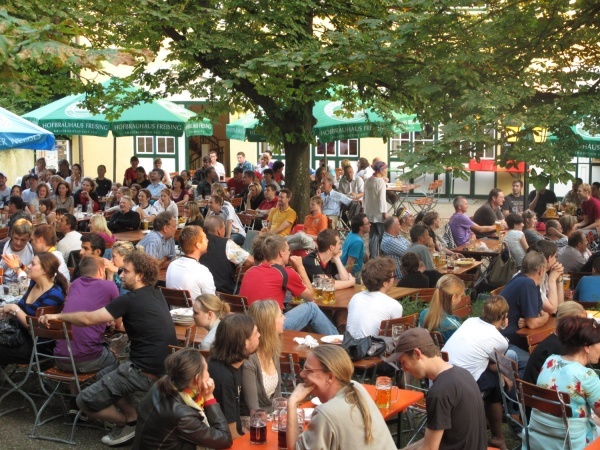 In 2010 a new leaseholder, Peter Sonnauer, took over the management and brought the traditional Bavarian beer garden concept back to life and Hofbrauhaus-Keller Freising immediately regained its popularity amongst the people of Freising. There are 650 seats in the self-serviced area of the beer garden and 120 seats on a serviced terrace at the opposite side of the building, in addition to an indoors restaurant and functions hall which can be booked for special events. The Hofbrauhaus Urhell (lager) served from the barrel costs €6,80 p/Maß. Hofbrauhaus-Keller in Freising has no connection to Hofbräuhaus and Hofbräukeller beer garden in Munich. The beer garden is open everyday during the summer between 10.30am and 11pm. This page was last modified on 18 May 2018, at 18:53.